I am a fully qualified multi award winning confectioner, and I studied and graduated in my craft at the South Glamorgan Institute of Higher Education. 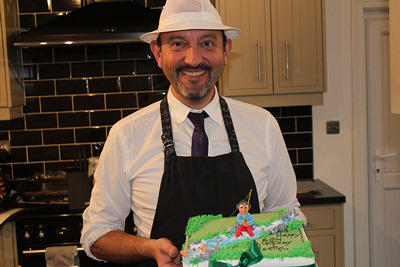 In addition, I hold all relevant food and hygiene certificates, to give you the confidence that your “Happy Occasions” cake will be created in the strictest of food production environments and at an industry recognised and accredited standard. I have been creating cakes for over 25 years, and my passion is to create cakes that are out of the ordinary. Almost anything can be created in the form of a cake, and I’m always delighted to create one that is individual and specific for your event. Please take the time to review the portfolio of cakes that I have created over the years. These are just a sample of many, with more options available upon discussion.